In Search of Soitec’s Newberry Solar 1 Project and AAA. With “Soitec completes its first solar power plant in California with modules from its new San Diego manufacturing facility”, Soitec SA (EPA:SOI) announced the completion of the 1.5 MWac (MegaWatt – alternating current) Newberry Solar 1 project during Intersolar North America 2013. Developed and constructed by Soitec Solar Development, LLC, a wholly owned subsidiary of Soitec, electricity generated by Newberry Solar 1 will be sold to Southern California Edison (SCE), an Edison International (NYSE:EIX) company, under the CREST (California Renewable Energy Small Tariff) program over a twenty (20) year period. Newberry Solar I used 720 CX-M500 CPV (Concentrator Photovoltaic) modules manufactured at the Soitec San Diego facility I visited in the Soitec Concentrator Photovoltaic Factory Grand Opening Tour. Since each Concentrix CX-S530 CPV system has twelve (12) CX-M500 CPV modules, Newberry Solar 1 has a total of sixty (60) CX-S530 CPV systems. Soitec also said the San Diego facility is supposed to reach its full 280 MWp (MegaWatt-peak) production capacity by October 2013, implying the addition of two (2) front-end assembly lines. 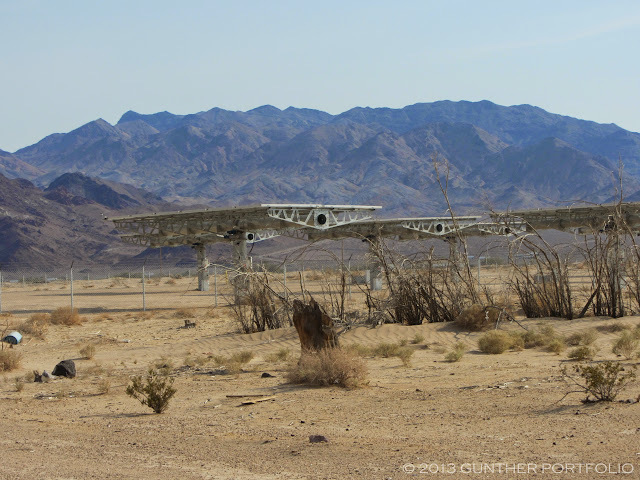 As foreshadowed by The Soitec Concentrator Photovoltaic Newberry Springs Uprising post, Newberry Springs was the first stop on my July 4th holiday weekend SoCal (Southern California) Road Trip. Arriving late in the afternoon, I was disappointed to find the Soitec solar plant offline with all of the Concentrix CX-S530 CPV systems stowed. I had expected the plant to be operating. 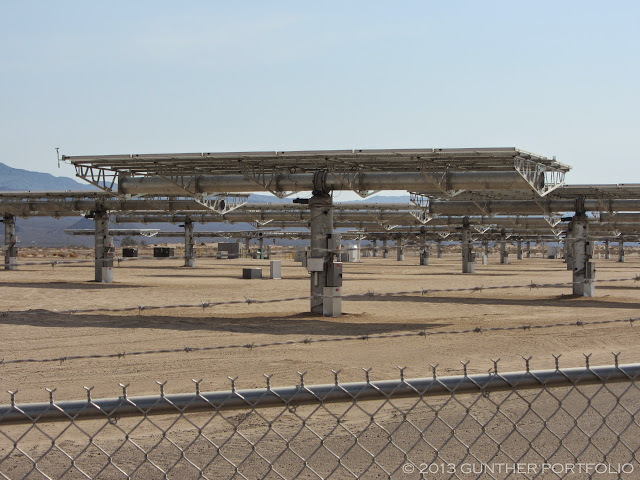 Through onsite and photo analysis, I was able to confirm there are 60 CX-S530 CPV systems at Newberry Solar I. However, the arrangement differs from the Site Plan submitted in the San Bernardino County Conditional Use Permit. From north to south, the CPV systems are built in six (6) east to west oriented rows of 14, 14, 13, 6, 6, and 7. I think each row of CPV systems is justified towards the western edge of the property as shown in the inset photos and the Picasa slideshow. It appears Newberry Solar I was built on the northern Area A sized 14.4 acres (5.75 hectares) shown on the Site Plan. I surveyed the site and neighboring properties for visual impacts and glare. The property to the north appears abandoned with nothing but building ruins. Neighbors to the east and west will have obstructed views of sunsets and sunrises respectively but still have good mountain views to the north and south. The southern neighbor will have certain views of the distant northern mountains obstructed. I could not assess the full impact of glare from the project since the systems were stowed. The metal trackers themselves did not create any noticeable glare as can be seen in the photos. I guess I’ll need to revisit the Newberry Solar I CPV plant again! 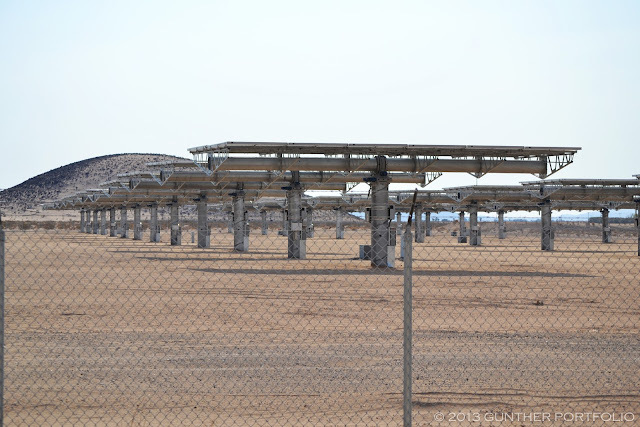 “Controversial solar plant completed in Newberry Springs” by Brooke Self for the DesertDispatch.com has the latest on local resident reactions. 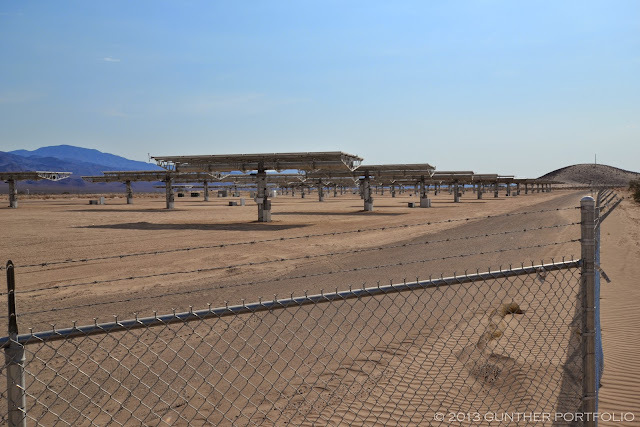 In my opinion, the biggest issues with the Newberry Solar I project changes were the sparse resident notification and the de-emphasis of the quadrupled array height by San Bernardino County in the project review. 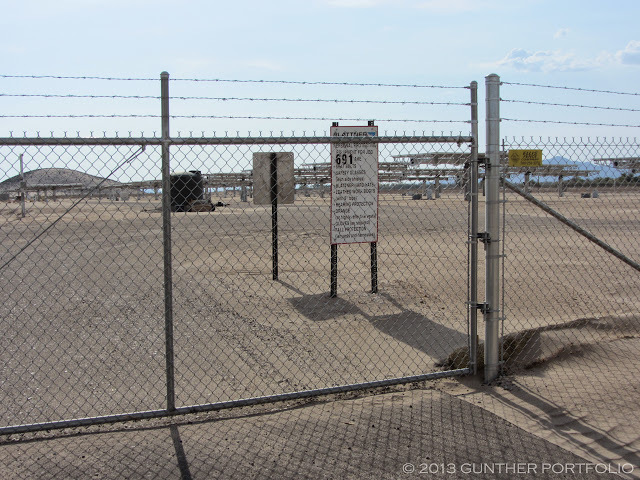 Well, this was not my first solar site survey or desert visit. As I pulled off the edge of the lightly trafficked asphalt Mountain View Road, my rear wheel drive sport coupe sunk into the loose shoulder sand. Thinking the better of my maneuver, I tried to reverse back onto the road without success. As I assessed the situation, not one but two Good Samaritans driving by offered assistance. Since the temperature was about 107 Fahrenheit (41.7 Celsius), I got the impression folks living in the desert are sensitive to the dangers and eager to pay it forward just in case they need help one day. Since I had joined AAA, the American Automobile Association or "Triple A", years earlier when I began these desert tours, I called them for professional help and the towing company dispatched from Barstow arrived at the exact time of the initial estimate! Maybe I should upgrade my AAA membership level? 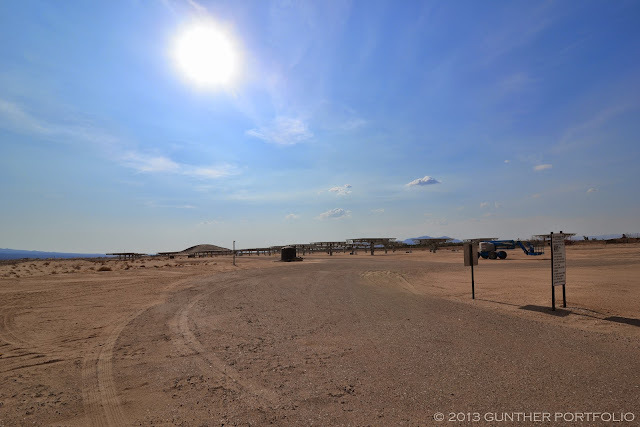 While waiting for the towing company, I continued to take photos and was completing my survey when a third car pulled into the solar plant entrance driveway. I was a bit concerned about these two gentlemen until one of them unlocked the gate and then drove into the plant. Of course, they were the evening and nighttime security for Newberry Solar I! Earlier, when I pulled onto the gravel shoulder of the I-40 access road to get my bearings to the project, another motorist stopped to check if I needed help. 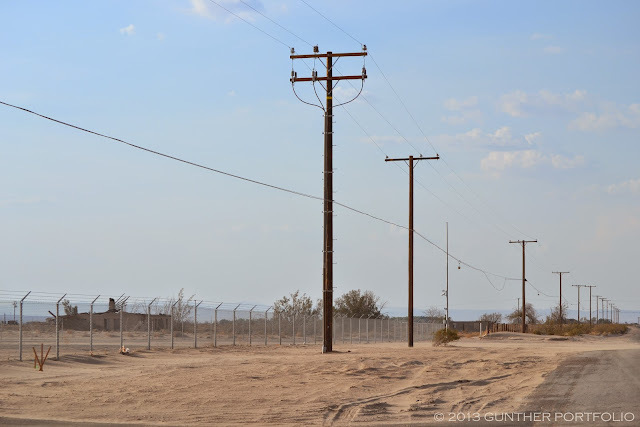 When I explained I was looking for the new solar plant, the resident directed me to the old parabolic trough Solar Electric Generating Station I (SEGS I) and SEGS II plants in Daggett. Not everyone in Newberry Spring knows or is concerned about the Newberry Solar I plant. 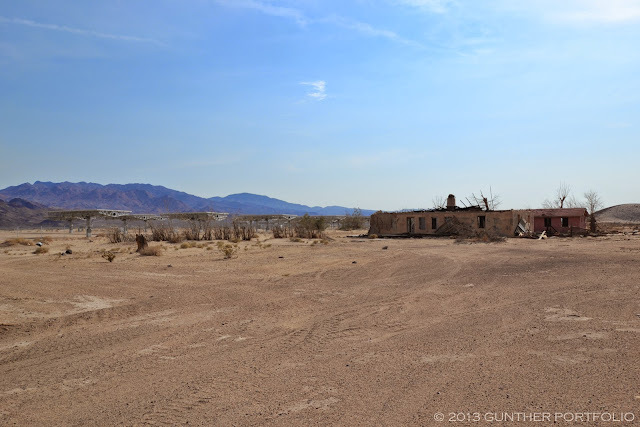 Newberry Springs was the undisclosed location. How would 2 axis trackers create glare when operating? Wouldn’t any reflection be directly back at the sun? Tom, what a diffuse solar irradiance? At UCSD, I saw odd light reflections from the modules. I reserve judgement on this until observing the site in operation. It’s a nice pic, but that level of ‘glare’ is something people would complain about on a sunny day in the desert? The physical presence of the panel and tracker seems a much bigger deal than the little bit of glare in the photo. je crois que certains préfèrent l’option nucléaire à d’invraisemblables reflets puisque, justement, les trackers sont pointés vers le soleil, ce qui exclut que des reflets démentent les lois de la physique.